Real Food Daily: Wheat Belly; Lose The Wheat, Lose The Weight! Wheat Belly; Lose The Wheat, Lose The Weight! I don’t know if it’s just me, but I find the rise in obesity among both adults and children in the U.S. very perplexing. After reading Dr. Davis’s book Wheat Belly, I was shocked to discover that the wheat we eat today is not the same wheat that our great-grandparents consumed. 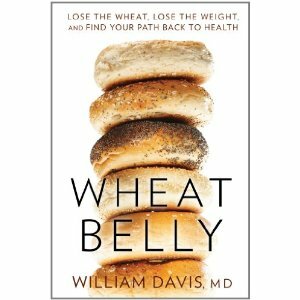 In Wheat Belly, Dr. Davis exposes the truth about modern-day wheat. Modern wheat causes blood sugar to spike more rapidly than eating pure table sugar (white sugar) and has addictive properties that cause us to ride a roller coaster of hunger, overeating and fatigue! In most grocery stores, entire aisles are devoted to bread in all its forms. As if that weren’t enough, there are yet more aisles full of cakes, cupcakes, cookies, pies, tarts, sweet rolls, bagels, croissants, brownies, cereals, and other sweet baked goods. And if you look at processed foods of all kinds, you’ll find wheat. And don’t even get me started on all the wheat lurking around in fast food and restaurant fare—wheat is everywhere! Wheat is the primary grain used in U.S. grain products; approximately three-quarters of all U.S. grain products are made from wheat flour. Dr. Davis explains that modern wheat is approximately 70% carbohydrate by weight. The carbohydrate in the form of a starch is called Amylopectin A. Amylopectin A is the most digestible form and is found in wheat. Because it is the most digestible, it is the form that most enthusiastically increases blood sugar. This explains why (gram for gram) wheat increases blood sugar to a greater degree than other carbohydrates such as lima beans or potato chips. The Amylopectin A of wheat products might be regarded as a super-carbohydrate, a form of highly digestible carbohydrate that is more efficiently converted to blood sugar than nearly all the other carbohydrate foods, simple or complex. What about whole grains? Isn’t whole grain bread better? Not according to Dr. Davis. The degree of processing, from a blood sugar standpoint, makes little difference: Wheat is wheat, with various forms of processing or lack of processing, simple or complex, high-fiber or low-fiber, all generating similar high blood sugars. Just as “boys will be boys,” Amylopectin A will be Amylopectin A. In healthy, slender volunteers, two medium-sized slices of whole wheat bread increase blood sugar by 30 mg/dl (from 93 to 123 mg/dl), no different from white bread. In people with diabetes, both white and whole grain bread increase blood sugar 70 to 120 mg/dl over starting levels. Dr. Davis devotes a significant part of this compelling book detailing many of the health problems associated with modern wheat consumption. He also describes his clinical experience in helping many of his patients kick their wheat habit and restore not only their health, but effortlessly return to their ideal weight. He describes the increase in celiac disease over the past 50 years. While the most severe form of celiac is easier to diagnose, there are milder forms that manifest themselves as anything from mysterious rashes that come and go to diarrhea and other GI disturbances to arthritic aches and pains. I agree wholeheartedly with Dr. Davis that the fat phobia of the past forty years turned people away from eating real food such as eggs, organic meats and full-fat dairy products, nuts, seeds, and healthy oils such as olive oil. But here’s the kicker, saturated fat was never the problem. Carbohydrates in combination with saturated fat cause measures of LDL particles to skyrocket. The problem has always been carbohydrates—not saturated fat. In fact, new studies have exonerated saturated fat as an underlying contributor to heart attack and stroke risk. Part three of the book is devoted to saying goodbye to wheat and creating a healthy and delicious new lifestyle by identifying and eliminating wheat in all forms. There are many tasty recipes included as well! This book, in my opinion, is one of the most important to have in your library (and your kitchen) if you’re serious about taking charge of your health. Trust me, it’s worth it! Real Food Daily is The celebration of real food for real people. My goal is to educate, inspire, and share delicious recipes! I admittedly have an obsession with food; local, fresh, whole food. I've learned that there is nothing particularly difficult about healthy eating. It is simply a common-sense approach to food that is easy to live with (once you get used to it.) If you are ready to change your diet, change your life, then now is the time to get started. Gluten Free; Celiac Disease or Gluten Intolerance?